Bus rides can be quite boring. You just want to get from one place to another. On some busses though you can now enjoy art while you wait to arrive at your destination. 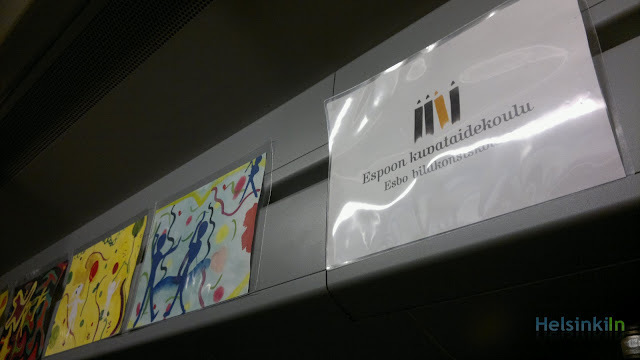 In cooperation with HSL the Espoo School of Art exhibits children’s art on busses between Espoo and Helsinki. As part of the World Design Capital the students were asked to make painting which were later put up in the busses. Hanna Koskimies, who organized the project explains: “We wanted to show the people something to make them happy. That is why we chose the theme ‘color’.” Over 200 pictures came together. The oldest artists are in their 20s, the youngest just turned 5. Till the end of May their works are visible on bus lines 11, 13, 132, 143, 145, 147, 150, 154 and 156. So next time you travel with the bus, look up. You might be lucky and get to see some fine colorful paintings.